Florence VanGordon, a lifelong resident of Milford, died at her home surrounded by family on December 30, 2018. She was 91 years old. Born at home on Washington Street in Milford, Michigan on December 17, 1927 she was the daughter of Oscar Hugh McFarlane and Matilda Martha Gaffka McFarlane. 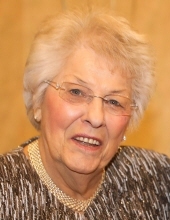 Florence was one of twenty-eight students in the 1947 graduating class at Hartland Highland School where she played on the tennis, softball, and basketball teams. On Friday nights she enjoyed rollerskating. Her mother died when she was nineteen and Florence helped to raise her three younger siblings. On February 18, 1950 she married the love of her life, Fredrick Nelson VanGordon in the old stone St. Mary’s Catholic Church on Commerce Street in Milford. Florence was active in her church and a member of the St. Mary’s Monday Literary Club. She was an avid card player, an original member of her Pinochle Club which formed in 1966, a member of a local Bridge Club and always ready for a game of Euchre with her friends and relatives. She enjoyed her bowling league for many years, Bingo and her friends at the Milford Senior Center, and gave of her time to volunteer with the Red Cross. She also loved to oil paint, write poetry and letters to her grandchildren. Florence was a woman of deep faith and a devoted wife, mother, grandmother and sister and will be dearly missed. She was preceded in death by Fred, her beloved husband of sixty-two years in 2013, and her son, Ron in 2011. She leaves her children, Bob (Barb) VanGordon, Patricia VanGordon, Don (Karen) VanGordon, Jeff (Nadeen) VanGordon; her daughter-in-law, Kathy; grandchildren, Cynthia Hutchins, Julie (Jason) Darr, Jill (Darrin) Loyer, Jessica (Michael) Dabish, Kayla (Evan) Meinicke, Erin (fiance Joey Williamson) VanGordon, Nicci (Kristjan) Jonnson, Carey Willis, Devin (Uyen) Willis, Elizabeth (Scott) Janson, J.T. (Jaclyn) VanGordon, Jared (Gianna) VanGordon; great grandchildren, Tyler, Cole, Logan, Avery, Alex, Bryce, Troy, Michael, Julian, Levi, Ryder, Eve Marie, Kara, Gavin, Penelope; her sister, Frances (Howard) Rabideau; her brother, Jerry (Janet) McFarlane; in-laws, Thelma McFarlane, Shirley, Phyllis Motley, Vivian (Val) Anderson, Harold (Marilyn) VanGordon, Crystal (Jerry) Garrett, Charles (Sue) VanGordon, and many nieces, nephews and dear friends including her beloved Pinochle Club. She was preceded in death by her parents, Oscar and Tillie McFarlane; brothers, John, Larry, Don, and Bernard McFarlane; in-laws, William “Bing” (Hattie) VanGordon, Arlo “Ed” (Dorothy) VanGordon, Roscoe (Stella) VanGordon, James “Luther” (Carolyn) VanGordon, Viola Esther, and Robert (Betty) VanGordon. Visitation will be held at Lynch & Sons Funeral Home, 404 E. Liberty St., Milford, on Thursday, January 3, from 2-8PM with a Rosary at 7PM. Mass of the Resurrection will be held at St. Mary Our Lady of the Snows Catholic Church, 1955 E. Commerce Road, Milford, on Friday, January 4, at 11AM. Friends may gather at the church after 10:30AM. Burial will follow at Milford Memorial Cemetery. Memorials may be made in her name to the church or to the Milford Senior Center. "Email Address" would like to share the life celebration of Florence VanGordon. Click on the "link" to go to share a favorite memory or leave a condolence message for the family.